This swing set model has been replaced with 90136 Lifetime Swing Sets. Please also see our comparable 493200 Swing Set. Lifetime Swing Sets - 258001 Playground Equipment - Small Clubhouse. Optional: You can purchase separately a full-bucket Infant/Toddler Swing, model 413000 Bucket Swing, to match your 268000 Earth Tones Play Set. Click here to view specifications and diagrams of the 268001 Small Deck Unit. Critical fall height ? 91.5"
Upright pole tubing 16 GA, 3 in. round, 92.15 in. 30.135 x 45.08 x .5 in. Side support pole tubing 3 in. round, 16 GA, 64 in. Swingbar tubing 16 GA, 3 in. round, 94 in. Swing Set weight capacity 700 lbs. Swings plastic, 5.5 x 26 in. 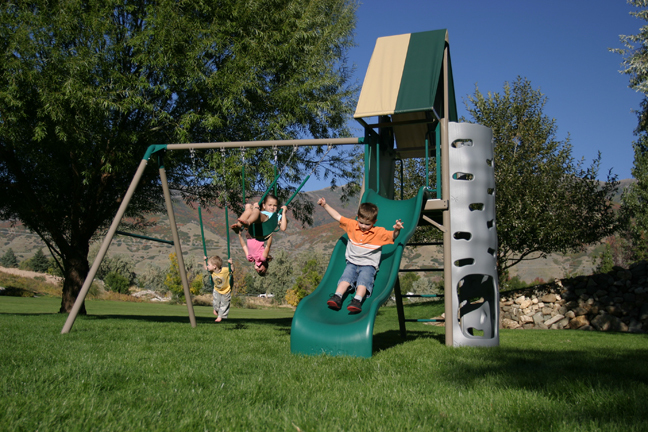 The Big Stuff metal swingset is much safer than wooden swingsets and is virtually maintenance free. So if you are wanting to build a swingset but don't have a lot of time, put away those complicated swingset plans and buy a Performance Design Big Stuff clubhouse and swingset. Each swingset is freestanding and assembly instructions are self-explanatory with illustrations. Each Big Stuff play set meets or exceeds the standards for home playground equipment and with the child size steps and handholds it is the perfect setting for your child to be active and explore. "...What a Great Product! Well built, great size for our small section of the yard. The kids love the chalkboard, captains wheel, binoculars, and especially the rock wall and slide, not to mention the swings or the actual tower. So many great activities integrated into a solid play set, for a smaller area. It's nice to see a product that is actually worth the price." While many of the Lifetime Products Swing Sets have been discontinued, there are still 4 active models we sell here at Competitive Edge. 493200. Dimensions: 110" x 32" x 36"